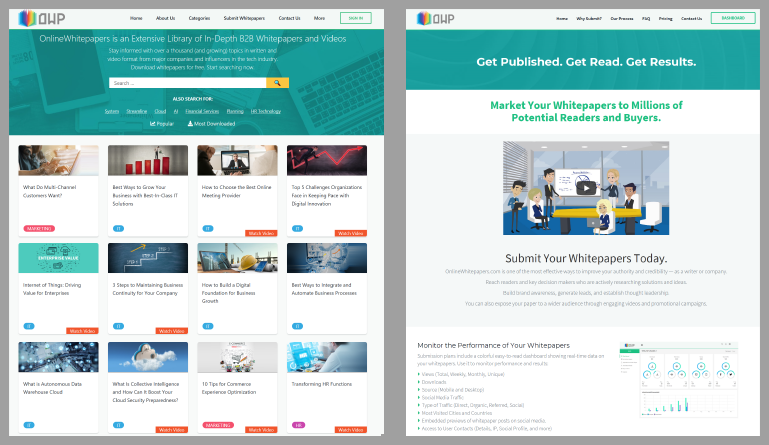 FRISCO, TEXAS— OnlineWhitepapers.com (OWP), a vast library of B2B whitepapers written by major companies and influencers, announced it has redesigned the site for smoother navigation and added new submission plans to help businesses market papers to millions of readers and customers. There are three flexible submission plans available to suit every budget. They include a free Basic option, the popular Standard offering, and an Enterprise package ideal for larger corporations with multiple users looking to post several whitepapers a month. Plans include monthly hosting and a dashboard with real-time analytics to help gauge whitepaper performance. The Standard and Enterprise levels also feature a 250-word topic description, SEO integration to draw people to the paper’s web page, a highlighted feature in OWP newsletters sent to millions of contacts around the world, and much more. To learn more, go to OnlineWhitepapers.com and visit the “Submit Whitepapers” section today. To keep up with the latest whitepaper additions, subscribe to the OWP newsletter and follow OWP on social media. Based in Frisco, Texas, Bython Media is a global digital publishing and marketing company. Its online properties deliver first-class content focusing on technology and research. The Bython marketing arm specializes in data-driven solutions that connect clients with customers on a deeper level and amass high-quality leads through its network of almost 30 million contacts. Visit bython.com.